Slumdog Millionaire is a 2008 British drama film that is a loose adaptation of the novel Q & A (2005) by Indian author Vikas Swarup, telling the story of Jamal Malik, age 18, from the Juhu slums of Mumbai. Starring Dev Patel as Jamal, and filmed in India, the film was directed by Danny Boyle, written by Simon Beaufoy, and produced by Christian Colson, with Loveleen Tandan credited as co-director. As a contestant on the Indian version of Who Wants to Be a Millionaire? Jamal Malik surprises everyone by being able to answer every question correctly. Accused of cheating, Jamal recounts his life story to the police, illustrating how he is able to answer each question correctly. After its world premiere at the Telluride Film Festival and later screenings at the Toronto International Film Festival and the London Film Festival, Slumdog Millionaire had a nationwide release in the United Kingdom on 9 January 2009, in India on 22 January 2009, and in the United States on 23 January 2009. Regarded as a sleeper hit, Slumdog Millionaire was widely acclaimed, being praised for its plot, soundtrack, direction, and performances, especially Patel's. It was nominated for ten Academy Awards in 2009 and won eight—the most for any 2008 film—including Best Picture, Best Director, and Best Adapted Screenplay. It won seven BAFTA Awards including Best Film, five Critics' Choice Awards and four Golden Globes. However it was also the subject of controversy, especially in India, due to its portrayal of Indian society, the use of the word "slumdog" in the title and the exploitation of some of the younger actors. 18-year-old Jamal Malik, an Indian Muslim from the Dharavi slum, is a contestant on the Indian version of Who Wants to Be a Millionaire?, and is one question away from the grand prize. However, before the ₹20 million (US$280,000) question, he is detained and tortured by the police, who suspect him of cheating because of the impossibility of a simple "slumdog" with very little education knowing all the answers. Jamal recounts, through flashbacks, the incidents in his life which provided him with each answer. Jamal's flashbacks begin with his managing, at age five, to obtain the autograph of Bollywood star Amitabh Bachchan, where he had to jump into a toilet cesspit when his brother Salim blocked the door, who later sells the autograph, followed immediately by the death of his mother during the Bombay riots. As they flee the riot, the brothers meet Latika, a girl from their slum. Salim is reluctant to take her in, but Jamal suggests that she could be the "third musketeer", a character from the Alexandre Dumas novel The Three Musketeers (which they had been studying—albeit not very diligently—in school), whose name they do not know. The three are found by Maman—a gangster who tricks and then trains street children into becoming beggars. When Salim discovers Maman is blinding the children in order to make them more effective beggars, he flees with Jamal and Latika to a departing train. Latika fails to board the train as Salim purposefully lets go of her hand, in revenge for an extremely embarrassing prank that Latika had played on Salim. This resulted in her being recaptured by Maman. Over the next few years, Salim and Jamal make a living travelling on top of trains, selling goods, picking pockets, working as dish washers, and pretending to be tour guides at the Taj Mahal, where they also steal people's shoes. At Jamal's insistence, they return to Mumbai to find Latika, discovering that she is being raised by Maman to be a prostitute, soon to fetch him a high price as a virgin. The brothers rescue her, and while escaping Maman they shoot him to death. Salim then manages to get a job with Javed—Maman's rival crime lord. Back at their room, Salim orders Jamal to leave him and Latika alone. When Jamal refuses, Salim draws a gun on him, whereupon Latika persuades Jamal to obey his brother and leave. Years later, Jamal, now a Chaiwala in an Indian call centre, searches the centre's database for Salim and Latika. He fails in finding Latika, while succeeding in finding Salim, now a high-ranking lieutenant in Javed's crime organization. Jamal reproaches Salim, who then pleads for forgiveness, and offers him to stay in his luxurious apartment. Jamal later bluffs his way into Javed's residence to reunite with Latika but as he professes his love for her, Latika asks him to forget about her. Jamal nevertheless promises to wait for her every day at five o'clock at the VT station. Latika attempts to meet him there, but is recaptured by Javed's men, led by Salim, and once Javed moves to another house, outside Mumbai, the two again lose contact. Jamal becomes a contestant on Who Wants to Be a Millionaire?, knowing that she watches the show regularly. Much to the consternation of Prem Kumar, the show's host, Jamal becomes a wonder across India. During a break before Jamal answers the penultimate question, Kumar tries to fool him by feeding him the wrong answer whilst in the men's room. After the break Jamal uses the 50/50 lifeline, leaving Kumar's answer and one other, but chooses the other one. The episode ends before the final question can be asked, and Kumar leads Jamal out of the studio where he is immediately forced into a police van. After an initial beating, the police inspector listens to Jamal's explanation of how he reached each answer. Finding all of them "bizarrely plausible", he allows him back on the show. At Javed's safehouse, Latika sees Jamal on the news and Salim, in an effort to make amends for his past behaviour, gives Latika his mobile phone and car keys, and asks her to forgive him and to go to Jamal. Latika is reluctant out of fear of Javed, but agrees and escapes. Salim fills a bathtub with money and sits in it, waiting for Javed and his men as they realize that he let Latika free. Jamal's final question is the name of the third musketeer in The Three Musketeers, which he never learned. Jamal uses his "Phone-A-Friend" lifeline to call Salim's phone, as it is the only phone number he knows. Latika answers the phone, and, while she does not know the answer, tells Jamal that she is safe. Relieved, Jamal arbitrarily picks Aramis, the right answer, and wins the grand prize. Javed hears Latika on the show and realises that Salim has betrayed him. He and his men break down the bathroom door but Salim kills Javed before he is shot, gasping, "God is great". Soon thereafter, Jamal and Latika meet on the platform at the railway station and they kiss. Dev Patel as Jamal Malik, a boy born and raised in the poverty of Bombay/Mumbai. Boyle considered hundreds of young male actors, and he found that Bollywood leads were generally "strong, handsome hero-types". Boyle's daughter pointed Dev Patel out from his role in the British television ensemble drama Skins. Freida Pinto as Latika, a girl from the streets who joins Jamal and Salim, then disappears; Jamal spends years hunting for her. Pinto was an Indian model who had not starred in a feature film before. Regarding the "one of a kind" scarf she wears, designer Suttirat Anne Larlarb says, "I wanted to bookend the journey—to tie her childhood yellow dress to her final look." Anil Kapoor as Prem Kumar, the game show host. Boyle initially wanted Indian actor Shahrukh Khan to play the role. Khan had hosted the 2007 series of Kaun Banega Crorepati, the Indian version of Who Wants to Be a Millionaire? Kapoor has also starred as a guest on the show with Amitabh Bachchan and won Rs 5,000,000. Screenwriter Simon Beaufoy wrote Slumdog Millionaire based on the Boeke Prize-winning and Commonwealth Writers' Prize-nominated novel Q & A by Vikas Swarup. To hone the script, Beaufoy made three research trips to India and interviewed street children, finding himself impressed with their attitudes. The screenwriter said of his goal for the script: "I wanted to get (across) the sense of this huge amount of fun, laughter, chat, and sense of community that is in these slums. What you pick up on is this mass of energy." By the summer of 2006, British production companies Celador Films and Film4 Productions invited director Danny Boyle to read the script of Slumdog Millionaire. Boyle hesitated, since he was not interested in making a film about Who Wants to Be a Millionaire?, which was produced by Celador. Then Boyle learned that the screenwriter was Beaufoy, who had written The Full Monty (1997), one of the director's favourite British films, and decided to revisit the script. Boyle was impressed by how Beaufoy wove the multiple storylines from Swarup's book into one narrative, and the director decided to commit to the project. The film was projected to cost $15 million, so Celador sought a US film distributor to share costs. Warner Independent Pictures stepped up with $5 million and won rights to the picture. Gail Stevens came on board to oversee casting globally. Stevens had worked with Boyle throughout his career and was well known for discovering new talent. Meredith Tucker was appointed to cast out of the US. The film-makers then travelled to Mumbai in September 2007 with a partial crew and began hiring local cast and crew for production in Karjat. Originally appointed as one of the five casting directors in India, Loveleen Tandan has stated, "I suggested to Danny and Simon Beaufoy, the writer of Slumdog, that it was important to do some of it in Hindi to bring the film alive [...] They asked me to pen the Hindi dialogues which I, of course, instantly agreed to do. And as we drew closer to the shoot date, Danny asked me to step in as the co-director." Boyle then decided to translate nearly a third of the film's English dialogue into Hindi. The director fibbed to Warner Independent's president that he wanted 10% of the dialogue in Hindi, and she approved the change. Filming locations included shooting in Mumbai's megaslum and in shantytown parts of Juhu, so film-makers controlled the crowds by befriending onlookers. Filming began on 5 November 2007. In addition to Swarup's original novel Q & A, the film was also inspired by Indian cinema. Tandan has referred to Slumdog Millionaire as a homage to Hindi cinema, noting that "Simon Beaufoy studied Salim-Javed's kind of cinema minutely." Boyle has cited the influence of several Bollywood films set in Mumbai. [i] Deewaar (1975), which Boyle described as being "absolutely key to Indian cinema", is a crime film written by Salim-Javed based on the Bombay gangster Haji Mastan, portrayed by Bollywood superstar Amitabh Bachchan, whose autograph Jamal seeks at the beginning of Slumdog Millionaire. Anil Kapoor noted that some scenes of the film "are like Deewaar, the story of two brothers of whom one is completely after money while the younger one is honest and not interested in money." Slumdog Millionaire has a similar narrative structure to Deewaar. Satya (1998), written by Saurabh Shukla (who plays Constable Srinivas in Slumdog Millionaire), and Company (2002), based on the D-Company, both offered "slick, often mesmerising portrayals of the Mumbai underworld" and displayed realistic "brutality and urban violence." Boyle has also stated that the chase in one of the opening scenes of Slumdog Millionaire was based on a "12-minute police chase through the crowded Dharavi slum" in Black Friday (2007), adapted from Hussein Zaidi's book of the same name about the 1993 Bombay bombings. Boyle has cited other Indian films as influences in later interviews. [ii] The rags-to-riches, underdog theme was also a recurring theme in classic Bollywood movies from the 1950s through to the 1980s, when "India worked to lift itself from hunger and poverty." Other classic Bollywood tropes in the film include "the fantasy sequences" and the montage sequence where "the brothers jump off a train and suddenly they are seven years older". The producer's first choice for the role of Prem Kumar was Shahrukh Khan, an established Bollywood star and host of the 2007 series of Kaun Banega Crorepati (the Indian version of Who Wants to Be a Millionaire?). However, Khan turned down the role, concerned that he did not want to give his audience the impression that the real show was a fraud by playing a fraud host in the movie. Despite the subsequent success of the film, Khan has stated that he does not regret turning the role down, and has been a vociferous supporter of the film to its critics. Paul Smith, the executive producer of Slumdog Millionaire and the chairman of Celador Films, previously owned the international rights to Who Wants to Be a Millionaire? In August 2007, Warner Independent Pictures acquired the North American rights and Pathé the international rights to distribute Slumdog Millionaire theatrically. However, in May 2008, Warner Independent Pictures was shut down, with all of its projects being transferred to Warner Bros., its parent studio. Warner Bros. doubted the commercial prospects of Slumdog Millionaire and suggested that it would go straight to DVD without a US theatrical release. In August 2008, the studio began searching for buyers for various productions, to relieve its overload of end-of-the-year films. Halfway through the month, Warner Bros. entered into a pact with Fox Searchlight Pictures to share distribution of the film, with Fox Searchlight buying 50% of Warner Bros.'s interest in the movie and handling US distribution. Following its success at the 81st Academy Awards, the film topped the worldwide box office (barring North America), grossing $16 million from 34 markets in the week following the Academy Awards. Worldwide, the film has currently grossed over $377 million, becoming Fox Searchlight Pictures's highest-grossing film ever (surpassing Juno). 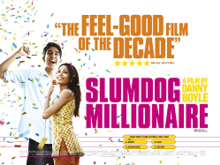 The Australian 2008 release of Slumdog Millionaire was produced by Icon Film Distribution. Slumdog Millionaire was first shown at the Telluride Film Festival on 30 August 2008, where it was positively received by audiences, generating "strong buzz". The film also screened at the Toronto International Film Festival on 7 September 2008, where it was "the first widely acknowledged popular success" of the festival, winning the People's Choice Award. Slumdog Millionaire debuted with a limited North American release on 12 November 2008, followed by a nationwide release in the United States on 23 January 2009. After debuting on a Wednesday, the film grossed $360,018 in 10 theatres in its first weekend, a strong average of $36,002 per theatre. In its second weekend, it expanded to 32 theatres and made $947,795, or an average of $29,619 per theatre, representing a drop of only 18%. In the 10 original theatres that it was released in, viewership went up 16%, and this is attributed to strong word-of-mouth. The film expanded into wide release on 25 December 2008 at 614 theatres and earned $5,647,007 over the extended Christmas weekend. Following its success at the 81st Academy Awards, the film's takings increased by 43%, the most for any film since Titanic. In the weekend of 27 February to 1 March, the film reached its widest release at 2,943 theatres. The film has grossed over $140 million at the North American box office. The film was released on DVD and Blu-ray in the United States on 31 March 2009. The film opened at No. 2 in the DVD sales chart, making $14.16m off 842,000 DVD units. As of 12 November 2009, an estimated 1,964,962 DVD units have been sold, translating to $31.32m in revenue. This figure does not include Blu-ray sales/DVD rentals. It had previously been announced that 20th Century Fox Home Entertainment would be starting a new marketing program with two versions of each release: a stripped-down minimal version for the rental market, and a traditional full version with "bonus extra" features, such as commentary and "making of" material for the retail market. The release production was mixed up; some full versions were shipped in rental cases, and some retail versions were missing the extras despite their being listed on the outside of the box. Public apologies were issued by Fox and Amazon. The film was released in the United Kingdom on 9 January 2009, and opened at No. 2 at the UK box office. The film reached No. 1 in its second weekend and set a UK box office record, as the film's takings increased by 47%. This is the "biggest ever increase for a UK saturation release," breaking "the record previously held by Billy Elliot's 13%." This record-breaking "ticket surge" in the second weekend came after Slumdog Millionaire won four Golden Globes and received eleven BAFTA nominations. The film grossed £6.1 million in its first eleven days of release in the UK. The takings increased by another 7% the following weekend, bringing the film's gross up to £10.24 million for its first seventeen days in the UK, and up to £14.2 million in its third week. As of 20 February 2009, the film's UK box office gross was £22,973,110, making it "the eighth biggest hit at UK cinemas of the past 12 months." In the week ending 1 March 2009, following its success at the 81st Academy Awards where it won eight Oscars, the film returned to No. 1 at the UK box office, grossing £26 million as of 2 March 2009. As of 17 May 2009, the total UK gross was over £31.6 million. The film was released on DVD and Blu-ray on 1 June 2009. The film's success at the Academy Awards led to it seeing large increases in takings elsewhere in Europe the following week. Its biggest single country increase was in Italy, where it was up 556% from the previous week. The takings in France and Spain also increased by 61% and 73% respectively. During the same week, the film debuted in other European countries with successful openings: in Croatia it grossed $170,419 from 10 screens, making it the biggest opening there in the last four months; and in Poland it opened in second place with a gross of $715,677. The film was released in Sweden on 6 March 2009 and in Germany on 19 March 2009. In India, the premiere of Slumdog Millionaire took place in Mumbai on 22 January 2009 and was attended by major personalities of the Indian film industry, with more than a hundred attending this event. A dubbed Hindi version, Slumdog Crorepati (स्लमडॉग करोड़पति), was also released in India in addition to the original version of the film. Originally titled Slumdog Millionaire: Kaun Banega Crorepati, the name was shortened for legal reasons. Loveleen Tandan, who supervised the dubbing, stated, "All the actors from the original English including Anil Kapoor, Irrfan Khan and Ankur Vikal dubbed the film. We got a boy from Chembur, Pratik Motwani to dub for the male lead Dev Patel. I didn't want any exaggerated dubbing. I wanted a young unspoilt voice." The film was also dubbed in Tamil as Naanum Kodeeswaran, with Silambarasan dubbing for Patel, while S. P. Balasubrahmanyam and Radha Ravi dubbed for Kapoor and Khan respectively. Fox Searchlight released 351 prints of the film across India for its full release there on 23 January 2009. It earned ₹23,545,665 (equivalent to ₹44 million or US$620,000 in 2018) in its first week at the Indian box office, or $2.2 million according to Fox Searchlight. Though not as successful as major Bollywood releases in India during its first week, this was the highest weekend gross for any Fox film and the third highest for any Western release in the country, trailing only Spider-Man 3 and Casino Royale. In its second week, the film's gross rose to ₹30,470,752 (equivalent to ₹57 million or US$800,000 in 2018) at the Indian box office. A few analysts have offered their opinions about the film's performance at the Indian box office. Trade analyst Komal Nahta commented, "There was a problem with the title itself. Slumdog is not a familiar word for majority Indians." In addition, trade analyst Amod Mehr has stated that with the exception of Anil Kapoor, the film lacks recognisable stars and that "the film... is not ideally suited for Indian sentiment." A cinema owner commented that "to hear slum boys speaking perfect English doesn't seem right but when they are speaking in Hindi, the film seems much more believable." The dubbed Hindi version, Slumdog Crorepati, did better at the box office, and additional copies of that version were released. Following the film's success at the 81st Academy Awards, the film's takings in India increased by 470% the following week, bringing its total up to $6.3 million that week. As of 15 March 2009, Slumdog Crorepati had grossed ₹158,613,802 (equivalent to ₹300 million or US$4.1 million in 2018) at the Indian box office. The film's success at the Academy Awards led to it seeing large increases in takings in the Asia-Pacific region. In Australia, the takings increased by 53%, bringing the film up to second place there. In Hong Kong, the film debuted taking $1 million in its opening weekend, making it the second biggest opening of the year there. The film was released in Japan on 18 April 2009, South Korea on 19 March 2009, China on 26 March 2009, Vietnam on 10 April 2009, and 11 April 2009 in the Philippines. In particular, the film was a major success in East Asia. In the People's Republic of China, the film grossed $2.2 million in its opening weekend (27–29 March). In Japan, the film grossed $12 million, the most the film has grossed in any Asian country. Slumdog Millionaire was critically acclaimed, named in the top ten lists of various newspapers. On 22 February 2009, the film won eight out of ten Academy Awards for which it was nominated, including the Best Picture and Best Director. It is the eighth film ever to win eight Academy Awards and the eleventh Best Picture Oscar winner without a single acting nomination. At the same time, Taare Zameen Par (Like Stars on Earth), India's submission for the Academy Award for Best Foreign Film, failed to make the short list of nominations and was frequently compared with Slumdog Millionaire in the Indian media. The film also won seven of the eleven BAFTA Awards for which it was nominated, including Best Film; all four of the Golden Globe Awards for which it was nominated, including Best Drama Film; and five of the six Critics' Choice Awards for which it was nominated. The much acclaimed title sequence has been honoured by a nomination at the prestigious 2009 Rushes Soho Shorts Film Festival in the 'Broadcast Design Award' category in competition with the likes of the Match of the Day Euro 2008 titles by Aardman and two projects by Agenda Collective. Outside of India, Slumdog Millionaire was met with critical acclaim. the film holds a 91% approval rating on Rotten Tomatoes based on 279 reviews, with an average score of 8.36/10. The consensus reads, "Visually dazzling and emotionally resonant, Slumdog Millionaire is a film that's both entertaining and powerful." On Metacritic, which assigns a normalised rating using reviews from mainstream critics, the film has an average score of 86 out of 100, based on 36 reviews, indicating "critical acclaim". Movie City News shows that the film appeared in 123 different top ten lists, out of 286 different critics lists surveyed, the 4th most mentions on a top ten list of any film released in 2008. Roger Ebert of the Chicago Sun Times gave the film 4 out of 4 stars, stating that it is, "a breathless, exciting story, heartbreaking and exhilarating." Wall Street Journal critic Joe Morgenstern refers to Slumdog Millionaire as, "the film world's first globalised masterpiece." Ann Hornaday of The Washington Post argues that, "this modern-day 'rags-to-rajah' fable won the audience award at the Toronto International Film Festival earlier this year, and it's easy to see why. With its timely setting of a swiftly globalising India and, more specifically, the country's own version of the Who Wants to Be a Millionaire TV show, combined with timeless melodrama and a hardworking orphan who withstands all manner of setbacks, Slumdog Millionaire plays like Charles Dickens for the 21st century." Kenneth Turan of the Los Angeles Times describes the film as "a Hollywood-style romantic melodrama that delivers major studio satisfactions in an ultra-modern way" and "a story of star-crossed romance that the original Warner brothers would have embraced, shamelessly pulling out stops that you wouldn't think anyone would have the nerve to attempt any more." Anthony Lane of the New Yorker stated, "There is a mismatch here. Boyle and his team, headed by the director of photography, Anthony Dod Mantle, clearly believe that a city like Mumbai, with its shifting skyline and a population of more than fifteen million, is as ripe for storytelling as Dickens's London [...] At the same time, the story they chose is sheer fantasy, not in its glancing details but in its emotional momentum. How else could Boyle get away with assembling his cast for a Bollywood dance number, at a railroad station, over the closing credits? You can either chide the film, at this point, for relinquishing any claim to realism or you can go with the flow—surely the wiser choice." Colm Andrew of the Manx Independent was also full of praise, saying the film "successfully mixes hard-hitting drama with uplifting action and the Who Wants To Be a Millionaire show is an ideal device to revolve events around". Several other reviewers have described Slumdog Millionaire as a Bollywood-style "masala" movie, due to the way the film combines "familiar raw ingredients into a feverish masala" and culminates in "the romantic leads finding each other." Other critics offered more mixed reviews. For example, Peter Bradshaw of The Guardian gave the film three out of five stars, stating that "despite the extravagant drama and some demonstrations of the savagery meted out to India's street children, this is a cheerfully undemanding and unreflective film with a vision of India that, if not touristy exactly, is certainly an outsider's view; it depends for its full enjoyment on not being taken too seriously." He also pointed out that the film is co-produced by Celador, who own the rights to the original Who Wants to Be a Millionaire? and claimed that "it functions as a feature-length product placement for the programme." A few critics outright panned it. Mick LaSalle of the San Francisco Chronicle states that, "Slumdog Millionaire has a problem in its storytelling. The movie unfolds in a start-and-stop way that kills suspense, leans heavily on flashbacks and robs the movie of most of its velocity. ... [T]he whole construction is tied to a gimmicky narrative strategy that keeps Slumdog Millionaire from really hitting its stride until the last 30 minutes. By then, it's just a little too late." Eric Hynes of IndieWIRE called it "bombastic", "a noisy, sub-Dickens update on the romantic tramp's tale" and "a goofy picaresque to rival Forrest Gump in its morality and romanticism." Slumdog Millionaire has been a subject of discussion among a variety of people in India and the Indian diaspora. Some film critics have responded positively to the film. At the same time, others objected to issues such as Jamal's use of British English or the fact that similar films by Indian filmmakers have not received equal recognition. A few notable filmmakers such as Aamir Khan and Priyadarshan have been critical of the film. Author and critic Salman Rushdie argues that it has "a patently ridiculous conceit." Adoor Gopalakrishnan, one of the most acclaimed film makers in India during the 1980s and 1990s and a five time Best Director winner of the Indian National Film Awards—the most prestigious film awards in India—lambasted Slumdog Millionaire, calling it in an interview to NDTV: "A very anti-Indian film. All the bad elements of Mumbai commercial cinema are put together and in a very a slick way. And it underlines and endorses what the West thinks about of us. It is falsehood built upon falsehood. And at every turn is fabricated. At every turn it is built on falsehood. I was ashamed to see it was being appreciated widely in the west...Fortunately Indians are turning it down." The film has been subject to serious academic criticism. Mitu Sengupta (2009 and 2010) raises substantial doubts about both the realism of the film's portrayal of urban poverty in India and whether the film will assist those arguing for the poor. Rather, Sengupta argues the film's "reductive view" of such slums is likely to reinforce negative attitudes to those who live there. The film is therefore likely to support policies that have tended to further dispossess the slum dwellers in terms of material goods, power and dignity. The film, it is also suggested, celebrates characters and places that might be seen as symbolic of Western culture and models of development. Ana Cristina Mendes (2010) places Boyle's film in the context of the aestheticising and showcasing of poverty in India for artistic (and commercial) purposes, and proceeds to examine "the modes of circulation of these representations in the field of cultural production, as well as their role in enhancing the processes of ever-increasing consumption of India-related images." However, there are others who point to the changing urban aspirations and prospects for mobility that can be seen in Indian cities such as Mumbai in which the film is set. The film is seen by D. Parthasarathy (2009) as reflecting a larger context of global cultural flows, which implicates issues of labour, status, ascription-achievement, and poverty in urban India. Parthasarathy (2009) argues for a better understanding of issues of dignity of labour and that the film should be interpreted in a more nuanced way as reflecting the role of market forces and India's new service economy in transforming the caste and status determined opportunity structure in urban India. Academic criticism has also been extended to the underlying philosophy of the film, with its apparent ends-justify-means message. Many elements of the film, including the apparent redemption of Salim at the end of his life and the film's subjugation of the suffering of peripheral characters to the romantic aspirations of Jamal, are characteristic, say such critics, of a naïve, Providence-based vision of reality. Slumdog Millionaire has stirred controversy on a few issues, including the welfare and illegal housing of its child actors and its portrayals of Indian communities. The Slumdog Millionaire soundtrack was composed by A. R. Rahman, who planned the score for over two months and completed it in two weeks. Danny Boyle has said that he chose Rahman because "not only does he draw on Indian classical music, but he's got R&B and hip hop coming in from America, house music coming in from Europe and this incredible fusion is created." Rahman won the 2009 Golden Globe Award for Best Original Score and won two Academy Awards, one for Best Original Score and one for Best Original Song for "Jai Ho". Rahman had two songs nominated for Best Original Song – the nomination for "O... Saya" was shared with M.I.A., while the win for "Jai Ho" was shared with lyricist Gulzar. The soundtrack was released on M.I.A. 's record label N.E.E.T.. On Radio Sargam, film critic Goher Iqbal Punn termed the soundtrack Rahman's "magnum opus" which will acquaint "the entire world" with his artistry. i Specifically, in the Kumar article, Boyle referred to Deewaar (1975) by Yash Chopra and Salim-Javed, Satya (1998) and Company (2002) by Ram Gopal Verma, and Black Friday (2007) by Anurag Kashyap. ii Some of the other Indian films cited by Boyle as reference points for the film include Satyajit Ray's Pather Panchali (1955), Mira Nair films such as Salaam Bombay! (1988), Ashutosh Gowarikar's Lagaan (2001), and Aamir Khan's Taare Zameen Par (2007). ^ a b "SLUMDOG MILLIONAIRE (15) - BBFC". BBFC. 7 May 2017. ^ "Slumdog Millionaire (2008)". Screen International. 6 September 2008. ^ "Slumdog Millionaire (2008)". British Film Institute. ^ Bradshaw, Peter (9 January 2009). "Slumdog Millionaire". The Guardian. The Guardian. ^ a b c d "Slumdog Millionaire (2008)". Box Office Mojo. Retrieved 12 October 2009. ^ The New York Times (11 November 2008). "Danny Boyle's "Slumdog Millionaire" Captures Mumbai, a City of Extremes - NYTimes". Somini Sengupta. ^ Tasha Robinson (26 November 2008). "Danny Boyle interview". The A.V. Club. Archived from the original on 2 December 2008. Retrieved 24 May 2009. ^ "Oscar nominations 2009: Indian director 'overlooked' for Slumdog Millionaire awards". The Daily Telegraph. 23 January 2009. ^ "Slumdog Millionaire at the London Film Festival – review". The Daily Telegraph. 31 October 2008. Retrieved 17 January 2012. ^ Shilpa Jamkhandikar (22 January 2009). ""Slumdog" premieres in India amid Oscar fanfare". Reuters. Retrieved 24 May 2009. ^ Anthony Lane (1 December 2008). "Slumdog Millionaire: The Film File: The New Yorker". The New Yorker. Retrieved 24 May 2009. ^ a b c d e Roston, Tom (4 November 2008). "'Slumdog Millionaire' shoot was rags to riches". The Hollywood Reporter. Retrieved 12 November 2008. ^ a b c Dawtrey, Adam (30 August 2007). "Danny Boyle to direct 'Slumdog'". Variety. Retrieved 15 January 2008. ^ As quoted by Lindsay Soll, "Finders Keepers", Entertainment Weekly 1029 (9 January 2009), p. 10. ^ Sandipan Dalal (24 August 2007). "Freeze kiya jaaye? SRK". The Times of India. Retrieved 24 May 2009. ^ "Slumdog Millionaire Interviews". Pyro Radio. Archived from the original on 15 July 2011. Retrieved 17 January 2009. ^ Evry, Max; Ryan Rotten (16 July 2007). "Exclusive: Danny Boyle on Sunshine!". ComingSoon.net. Retrieved 15 January 2008. ^ "I sometimes feel like I'm the off-screen 'millionaire': Loveleen". Hindustan Times. 1 January 2009. Retrieved 24 May 2009. ^ Lal, Vinay (2012). Deewar. Harper Collins. p. 5. ISBN 9789350292464. ^ a b c Alkarim Jivani (February 2009). "Mumbai rising". Sight & Sound. Retrieved 1 February 2009. ^ Mark Magnier (25 January 2009). "Slumdog draws crowds, but not all like what they see". The Age. Melbourne, Australia. Retrieved 24 May 2009. ^ a b "I don't regret turning down Slumdog: SRK". The Times of India. 20 January 2009. Retrieved 21 January 2009. ^ "Shah Rukh Khan slams Slumdog Millionaire critics". Dnaindia.com. 9 February 2009. Retrieved 8 February 2014. ^ Eoghan Williams (21 October 2007). "Quiz show king didn't want to be a millionaire". Sunday Independent. ^ Walker, Tim (21 January 2009). "All you need to know about Slumdog Millionaire". The Independent. London. Retrieved 21 January 2009. ^ Goldstein, Patrick (12 August 2008). "Warners' films: Movie overboard!". Los Angeles Times. Retrieved 12 November 2008. ^ Flaherty, Mike (20 August 2008). "Fox, WB to share 'Slumdog' distribution". Variety. Retrieved 12 November 2008. ^ a b c d e f Conor Bresnan (5 March 2009). "Around the World Roundup: 'Slumdog' Surges". Box Office Mojo. Retrieved 16 March 2009. ^ Kearney, Christine (1 September 2008). "Boyle film leads buzz at Telluride Film festival". Reuters. Retrieved 12 November 2008. ^ Phillips, Michael (8 September 2008). "'Slumdog' artful, if extreme". Chicago Tribune. Retrieved 12 November 2008. ^ Susan Wloszczyna (15 September 2008). "'Slumdog Millionaire' hits it big with audience award". USA Today. Archived from the original on 21 February 2009. Retrieved 17 January 2012. ^ a b "Slumdog Millionaire (2008) – Daily Box Office". Box Office Mojo. Retrieved 26 January 2009. ^ a b "Slumdog Millionaire (2008) – Weekend Box Office Results". Box Office Mojo. Retrieved 31 March 2009. ^ "Slumdog Millionaire". The-numbers.com. Retrieved 17 January 2011. ^ Knegt, Peter (24 November 2008). "indieWIRE: iW BOT – "Slumdog" Poised To Become Season's Success Story". indieWIRE. Archived from the original on 28 December 2008. Retrieved 26 November 2008. ^ "Daily Box Office for Friday, February 27, 2009". Box Office Mojo. Retrieved 16 February 2018. ^ Ben Child (2 March 2009). "Oscars give Slumdog Millionaire box-office boost as child stars readjust". The Guardian. London. Retrieved 5 March 2009. ^ "Slumdog Millionaire (2008)". Box Office Mojo. Retrieved 20 March 2009. ^ a b "Slumdog Millionaire – DVD Sales". The Numbers. Retrieved 30 August 2010. ^ "Fox DVD stumbles with 'Slumdog'". Variety. 1 April 2009. Retrieved 17 January 2012. ^ "UK Box Office: 9–11 January 2009". UK Film Council. Archived from the original on 8 June 2009. Retrieved 24 May 2009. ^ "Slumdog Mauls Box Office Record". Sky News. 20 January 2009. Archived from the original on 23 January 2009. Retrieved 23 January 2009. ^ Gant, Charles (27 January 2009). "Slumdog runs and runs atop UK box office". The Guardian. London. Retrieved 28 January 2009. ^ Matt Smith (26 January 2009). "Slumdog Is Top Dog In UK Cinemas". Sky News. Archived from the original on 20 April 2009. Retrieved 27 January 2009. ^ "Slumdog still leads UK box office". BBC News. 3 February 2009. Retrieved 3 February 2009. ^ "United Kingdom Box Office Returns for the weekend starting 20 February 2009". Internet Movie Database. Retrieved 2 March 2009. ^ Gant, Charles (24 February 2009). "UK box office: Half-term shot in the arm for Bolt". The Guardian. London. Retrieved 2 March 2009. ^ "UK Box Office: 27 February – 1 March 2009". UK Film Council. Archived from the original on 23 May 2009. Retrieved 24 May 2009. ^ "Slumdog tops box office again". Teletext. 2 March 2009. Archived from the original on 6 March 2009. Retrieved 2 March 2009. ^ "UK Box Office: 15–17 May 2009". UK Film Council. Archived from the original on 23 May 2009. Retrieved 24 May 2009. ^ Aryan, Tony (22 January 2009). "Aamir, Hrithik, Imran, Sonam attend Slumdog Millionaire premiere". Radio Sargam. Retrieved 22 January 2009. ^ Jeremy Page (24 January 2009). "A thousand words: Slumdog Millionaire opens in India". The Times. London. Retrieved 24 May 2009. ^ Toshniwal, Chhaya (8 June 2009). "He gave Jamaal his kamaal". DNA. Retrieved 16 February 2018. ^ "'Slumdog Millionaire' in Tamil". The Hindu. 4 February 2009. Retrieved 21 September 2015. ^ "Now, a Tamil Slumdog!". Rediff.com. 4 February 2009. Retrieved 22 September 2015. ^ a b Madhur Singh (26 January 2009). "Slumdog Millionaire, an Oscar Favorite, Is No Hit in India". Time. Retrieved 27 January 2009. ^ a b "Box Office India". Bollywood Hungama. Archived from the original on 29 January 2009. Retrieved 9 February 2009. ^ Shilpa Jamkhandikar (30 January 2009). "Piracy, controversy mar Slumdog's India run". Canada.com. Reuters. Archived from the original on 22 January 2016. Retrieved 30 January 2009. ^ "Results for Week Updated 3/15/2009". IBOS – The Complete Channel on Indian Film Industry Box Office. Retrieved 20 March 2009. ^ Pamela McClintock (24 April 2009). "'Slumdog' ends tour with Asian feat: China, Japan embrace Oscar-winning pic". Variety. Retrieved 18 May 2009. ^ "Metacritic: 2008 Film Critic Top Ten Lists". Metacritic. Archived from the original on 2 January 2009. Retrieved 11 January 2009. ^ Anita Singh (23 February 2009). "Oscar winners: Slumdog Millionaire and Kate Winslet lead British film sweep". The Daily Telegraph. London. Retrieved 24 May 2009. ^ Joyce Eng (20 February 2009). "Oscars: Who Will Win and Who Will Surprise?". TV Guide. Retrieved 24 May 2009. ^ PTI (14 January 2009). "Aamir's 'Taare Zameen Par' misses Oscar shortlist". DNA. Retrieved 26 May 2010. ^ PTI (17 February 2009). "Govt. lauds Rahman, 'Slumdog' team". The Hindu. Archived from the original on 1 September 2012. Retrieved 26 May 2010. ^ AFP (13 January 2009). "Is 'Slumdog' India's?". AsiaOne. Retrieved 26 May 2010. ^ "UPDATE: How "Toxic" Is IFTA's Best Indies?". Deadline. Retrieved 23 January 2017. ^ "Slumdog Millionaire (2008)". Rotten Tomatoes. Fandango Media. Retrieved 20 March 2019. ^ "Slumdog Millionaire Reviews". Metacritic. CBS Interactive. Retrieved 27 February 2018. ^ David Poland (2008). "The 2008 Movie City News Top Ten Awards". Archived from the original on 21 January 2009. Retrieved 25 January 2009. ^ Ebert, Roger (11 November 2008). "Slumdog Millionaire". Chicago Sun-Times. Retrieved 13 January 2009. ^ Morgenstern, Joe (14 November 2008). "'Slumdog' Finds Rare Riches in Poor Boy's Tale". The Wall Street Journal. Retrieved 16 January 2009. ^ Hornaday, Ann (12 November 2008). "From 'Slumdog' to Riches In a Crowd-Pleasing Fable". The Washington Post. Retrieved 13 January 2009. ^ Turan, Kenneth (12 November 2008). "Life is the Answer". Los Angeles Times. Retrieved 17 January 2012. ^ Lane, Anthony (24 November 2008). "The Current Cinema: Hard Times". The New Yorker. 84 (38): 130–131. Retrieved 16 April 2009. ^ Sudhish Kamath (17 January 2009). "The great Indian dream: Why "Slumdog Millionaire", a film made in India, draws crowds in New York". The Hindu. Retrieved 22 January 2009. ^ Scott Foundas (12 November 2008). "Fall Film: Slumdog Millionaire: Game Show Masala". LA Weekly. Retrieved 22 January 2009. ^ Greg Quill (21 January 2009). "Slumdog wins hearts here". Toronto Star. Retrieved 22 January 2009. ^ Peter Bradshaw (9 January 2009). "Slumdog Millionaire". The Guardian. London. Retrieved 9 January 2009. ^ LaSalle, Mick (12 November 2008). "'Slumdog Millionaire' ultimately pays off". San Francisco Chronicle. Retrieved 13 January 2009. ^ Hynes, Eric (11 November 2008). "Trivial Pursuit: Danny Boyle's "Slumdog Millionaire"". IndieWIRE. Retrieved 12 November 2008. ^ Rushdie, Salman (28 February 2009). "A Fine Pickle". The Guardian. London. ^ "Adoor Gopalakrishnan - Exclusive Interview on NDTV Hindu Night Vision- Part 3 - 3". YouTube. 18 July 2009. Retrieved 28 February 2013. ^ Mendes, Ana Cristina (July 2010). "Showcasing India Unshining: Film Tourism in Danny Boyle'sSlumdog Millionaire". Third Text. 24 (4): 471–479. doi:10.1080/09528822.2010.491379. ISSN 0952-8822. ^ Parthasarathy, D. (30 September 2009). "Of Slumdogs, Doxosophers, and the (In)Dignity of Labour(ers)". SSRN: 14. SSRN 2096954. ^ a b Podgorski, Daniel (17 September 2015). "All's Unwell that Only Ends Well: The Inconsistent Meaning of Life in Slumdog Millionaire". The Gemsbok. Retrieved 16 February 2018. ^ Hill, Logan (12 November 2008). "Composer A.R Rahman on the Sounds of 'Slumdog Millionaire' and Being M.I.A. 's Idol". New York. Retrieved 14 November 2008. ^ Goher Iqbal Punn (25 January 2009). "Review: Slumdog Millionaire". Radio Sargam. Retrieved 24 May 2009.